: Some features, such as Sirius satellite radio, may not be available in your location. Check with your authorized dealer. • Store your favorite stations for later access. 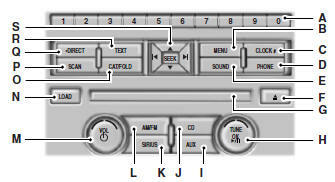 When tuned to any station, press and hold a preset button until sound returns and PRESET # SAVED appears in the display. • Save presets automatically by using the autoset feature. Press MENU repeatedly until AUTO PRESET ON/OFF appears in the display. Use the SEEK buttons to turn AUTO PRESET to ON, and either wait five seconds for the search to initiate or press OK to immediately start the search. If you press another control within those five seconds, the search does not start. The system fills the presets with the 10 strongest stations; the station stored in preset 1 begins playing. If there are fewer than 10 strong stations, the system stores the last one in the remaining presets. : Autoset does not delete your original preset stations. : In order to re-run the autoset features, you must first turn it off before turning it back on. • Compression brings the soft and loud CD passages together for a more consistent listening level. • Shuffle plays the current CD tracks in random order. • RDS Radio allows you to search RDS-equipped stations for a certain category of music format such as CLASSIC, COUNTRY, JAZZ/RB or ROCK. • SIRIUS allows you to access different satellite radio options. C. CLOCK: Press this button to set the time. Use the memory presets buttons to enter the time, and then press OK.
D. PHONE: Press this button to access the phone features of the SYNC® system. See the SYNC® chapter for more information. If your vehicle is not equipped with SYNC®, the display reads NO PHONE. E. SOUND: Press this button to access settings for Treble, Middle, Bass, Balance and Fade. Use the SEEK or TUNE controls to change the settings. • Bass levels can be increased or decreased. • Treble levels can be increased or decreased. • Balance adjusts the sound between left and right speakers. • Fade adjusts the sound between the front and back speakers. • Speed Compensated Volume adjusts the volume to compensate for speed and wind noise. You can set the system between off and +7. • All Seat Mode/Driver Seat Mode/Top Down Mode (if equipped) optimizes sound quality for the chosen seating position. • DSP Mode (if equipped) allows you to choose between STEREO SURROUND mode and STEREO mode. F. Eject: Press this button to eject a CD. G. CD slot: Insert a CD. • In radio mode, turn the control to manually search through the radio frequency band. • In Sirius mode, turn the control to find the next or previous available satellite radio station. • OK allows you to confirm commands with phone and media features. If your vehicle is equipped with SYNC®, see the SYNC® chapter for more information. • Play/Pause allows you to play or pause a track when listening to a CD. I. AUX: Press this button to access media through your auxiliary input jack. If your vehicle is equipped with SYNC®, see the SYNC® chapter for more information. J. CD: Press the CD button to access CD and MP3 modes. • The disc begins to play where it left off. If no CD is loaded, NO DISC appears in the display. • Press the SEEK buttons to access the previous or next track. Press and hold the SEEK buttons to quickly reverse or fast forward within the same track. K. SIRIUS: Press this button to access different satellite radio modes. Note: Sirius satellite radio is available only with a valid Sirius radio subscription. Check with your authorized dealer for availability. L. AM/FM: Press this button to select a frequency band. N. LOAD: This control is not operational. To load a CD, insert the disc, label side up, into the CD slot. • In Sirius mode, press this button to switch between turning the most recently selected satellite radio category off or on. • In MP3 mode, press this button, then use the SEEK buttons to access the previous or next folder. • In radio mode, press this button to hear a brief sampling of all radio stations. • In Sirius mode, press this button to hear a brief sampling of all available channels. If you select a specific category, press SCAN for a brief sampling of all available channels within the selected category. • In CD and MP3 modes, press this button to hear a brief sampling of all tracks on the current disc or MP3 folder. • In radio mode, press this button to select the desired radio frequency (such as 93.9) using the memory preset numbers (0–9). • In Sirius mode, press this button to enter the desired channel (such as 002) using the memory preset buttons. If you only enter one digit, and press OK, the system goes to that channel. If you enter three digits, the system automatically goes to that channel, if available. You may cancel your entry by pressing DIRECT. If you enter an invalid station number, INVALID CHANNEL appears in the display and the system continues playing the current station. • In CD mode, press this button to enter the desired track number using the memory preset buttons. The system then begins playing that track. • In MP3 mode, press this button to enter a memory preset button of the desired folder. The system advances to that specific folder. • MP3 mode, press this button to view Album (AL), Folder (FL), Song (SO) and Artist (AR) in the display, if available. • In text mode, sometimes the display requires additional text to show. When the < / > indicator is on, press this button, then use the SEEK buttons to view the additional text. • In Sirius mode, press one of these buttons to select the previous or next channel. If you select a specific category (such as Jazz, Rock or News), use these buttons to find the previous or next channel in the selected category. • In CD and MP3 modes, press one of these buttons to select the previous or next track.